Bottom club Falkirk claimed the win right at the death when Scott Harrison knocked the ball home after a free kick. Inverness had opened the scoring early when Tom Walsh slotted in before a Zak Rudden double turned the game on it's head. George Oakley stooped to head home from close range with half an hour to go but Inverness were unable to add to that before being hit with the sucker punch. The hosts squandered a raft of chances in the second half after a poor first forty-five and once more paid the price for a lack of composure in front of goal. That late goal ended the worst unbeaten run anywhere in the world where draws became more important than winning. With that monkey off the back, maybe we can go out and play something more entertaining for the fans and hopefully bag a few wins. If not, then we look to be in big trouble and sliding into obscurity. A bright but chilly afternoon with 2260 spectators saw the hosts get off to the perfect start. We played briskly from defence when Sean Welsh passed forward to Liam Polworth, he spun round and threaded a lovely ball into the path of Tom Walsh who took a touch towards the corner of the six yard box then drilled low across the keeper into the bottom corner. Great start but could we build on it? The answer became apparent as Falkirk got to grips with the game and broke forward at pace at every opportunity as we reverted to holding onto the ball at all costs. Their persistence paid off when they burst down the right, three passes and a Petravicius cross later Zac Rudden was left unmarked to nod into the net with Ridgers merely a spectator, helped to watch by Brad Mckay and Shaun Rooney, when maybe they should have been more involved. Good goal from the Bairns point of view, sloppy from ours. Falkirk survived a massive penalty claim when George Oakley was manhandled to the ground by Scott Harrison as he entered the box on the left edge. Referee Colin Steven deemed that the crime started outside the box and a free kick was awarded which we wafted way over the bar, one of many wayward attempts from crosses, corners to free kicks. Aaron Doran was buzzing in and around the visitors box and he had one effort blocked by the legs of Leo Fassan in the Falkirk goal. Falkirk were still looking more direct on the break and it was no big surprise when they scored a second and no surprise it came as a result of more ball watching from Shaun Rooney. A quick free kick saw a long ball floated over the less than alert defender and Rudden capitalised to gather the ball and head goalwards. It was a fairly tight angle but from about three yards out from the bye line he managed to squeeze the ball through Ridgers and in off the far post. 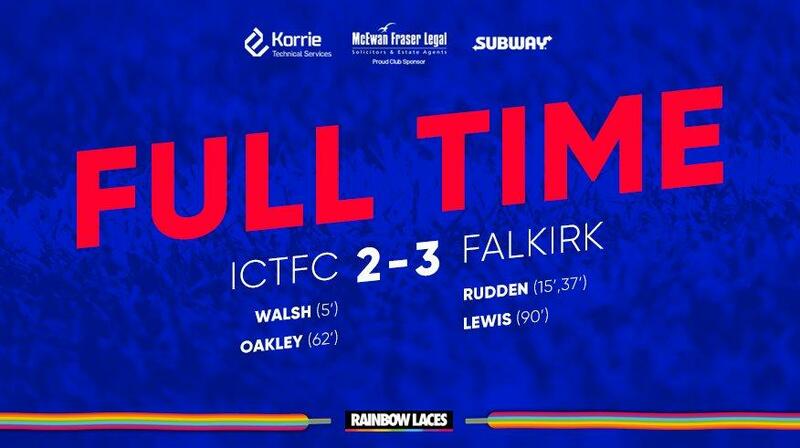 Another good goal for Falkirk, another self inflicted disaster from us. Oakley headed well over the bar from a corner when he should have been hitting the target as we tried to get back on level terms before the break, however most of our moves as usual broke down in the final third. More urgency was shown after the interval and Rooney was deployed further up the park where we were hopeful he could make amends for his earlier slackness. At least there was less chance of us conceding when he was at the other end of the park. He did get a useful low ball into the box after ducking in between two players but Oakley's slid attempt just went a foot over the top of the bar as it dipped over. Close, but no cigar. Oakley appeared to be shoved in the back for a second time but the referee chose to ignore this one completely for what looked like a stonewall penalty. A goal was coming for the hosts but not yet. The now familiar sight of Jordan White getting under a cross, leaning back and heading an inviting cross over the bar from inside the six yard box was too much for some to take, an outburst of biblical proportions from some filled the air. Ridgers had been idle for most of the second half but he had to look sharp to get down low to his left post to tip a curling shot round the post from Paton. We would not be denied though and a deep corner was headed back into the mix by Rooney where it bounced kindly for Oakley to stoop and nod the ball in from close range. That goal prompted an assault on the advertising hoarding as two or three jubilant players were fouled by our sponsor McEwan Fraser, but it was not legal. Game on! We pressed hard for the winner and Joe Chalmers curled an effort just over the junction but it was not to be. Tom Walsh tried a low shot to the near post but Fassan parried then a defender blocked the rebound as White tried to turn it in, but it was not to be. Then, out of nothing, deep into stoppage time, a late free kick wide right for Falkirk saw a dangerous ball swing to the back post where Donaldson was the wrong side of Harrison and he bundled the ball in to the delight of the visiting fans. Misery complete for the home fans who had seen enough. So, the unbeaten run ends. Thank Christ we all sigh, now let's get the season started. It could be a make or break week with a tough cup tie on Tuesday and an even tougher trip to Somerset Park on Friday. Our normally reliable defence let us down today but Donaldson and McCart still played well, despite the odd lapse. Ridgers has had better days and the forwards did what we expected, missed loads of chances, so there you have it, run over and beaten by the bottom club. Let's end on a bright note. Roddy MacGregor was a late sub and looks like a bright prospect. "Awful defending from Mckay for the first Rudden goal. It's almost as if someone playing as ICT on FIFA suddenly loses their controls connection with the PS4 as he just stops dead and doesn't even bother trying to challenge for the ball. As if that wasn't bad enough Rooney then follows it up by getting distracted by a shiny object in the North Stand and forgets to challenge Rudden for the ball and let him ghost past before finishing well past Ridgers.﻿"
Inverness Caledonian Thistle manager John Robertson: "I'm hugely disappointed. We didn't deserve to lose the game. We created chance after chance after chance and got caught by a sucker punch. "It's cruel on the players. The worst we should have got was a point but we desperately wanted all three." Falkirk manager Ray McKinnon: "I'm really, really happy with the guys. They executed the game plan brilliantly. We got off to a bad start but responded well and right at the end we tried to win the game. "Inverness are a good side that's why they are unbeaten for 25 games. We worked extremely hard and we got the rewards." Subs (not used): Hoban; Trafford, White, MacGregor, Nicolson, Brown, Harper. Subs (not used): Mitchell, Dallison, Dumbuya, Russell.